Profile | Alexander Katlan Conservator inc. 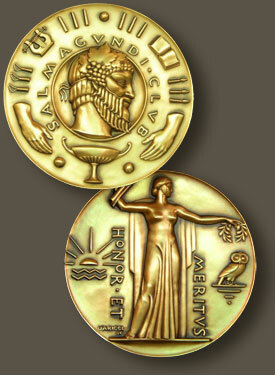 In 2008, Alexander Katlan was awarded the Medal of Honor and Merit from the Salmagundi Club of New York City. The Salmagundi Club Medal of Honor and Merit is awarded to distinguished citizens in various fields, in the name of the Club’s devotion to those endeavors which link one area of culture to another and one human being to another. In June of 1970 the Apollo XIII astronauts: Captain James A. Lovell, Jr., Fred W. Haise, Jr. and John L. Swigert, Jr. received the Award for outstanding scientific achievements. Other recipients include artists: Norman Rockwell, Ogden Pleissner, Al Hirschfield, Frank Mason and Everett Raymond Kinstler as well as the director of the Metropolitan Museum of Art Thomas Hoving, publisher Malcolm S. Forbes and art historian William H. Gerdts. Mr. Alexander Katlan has participated in micro-chemical analysis and art conservation microscopy courses with Dr Walter McCrone of the McCrone Research Institute, Chicago Illinois. He was awarded in 1979, his Master’s of Fine Art Degree in painting conservation from Dominican University, Villa Schifanoia, Florence, Italy and a Master’s of Art Degree in Art History from Queens College, City University of New York, in 1987. Professional Associate status has been awarded by the American Institute of Conservation. He has received conservation fellowships from the Smithsonian Institution, National Museum of American Art and conservation grants from the National Endowments of the Arts, the New York State Council of the Arts, the Institute of Museum Services and the Bay Foundation. In 2008, he was awarded and is the recipient of the Medal of Honor and Merit from the Salmagundi Club, NYC. He is a member of the American Institute of Conservation, since 1977, a member of the International Institute of Conservation London England since 1975, a past member of the New York Microscopical Society (and has published in Microscope Magazine), and a founding organizer of the New York Conservation Association. Mr. Katlan has published in many journals including The Journal of the American Institute of Conservation and has written four art reference books; two of the latest books are on the exhibition history of the Salmagundi Club. 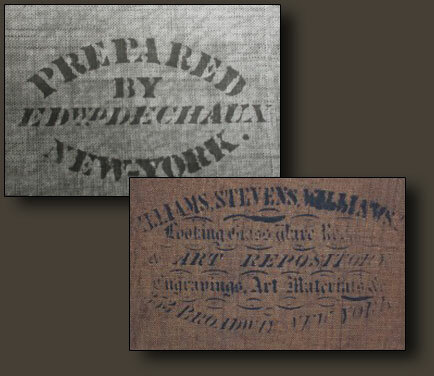 The earlier titles are on the history of painting materials such as canvases and stretchers and are entitled American Artist’s Materials Suppliers Directory: Nineteenth Century, published in 1987 by Noyes Press and American Artists’ Materials: A Guide to Stretchers, Panels, Millboards and Stencil Marks in 1992 by Sound View Press. Mr. Katlan was an adjunct professor at New York University in the Appraisal Studies Program for twelve years and has also taught at C.W. Post University. He has given lectures at the National Gallery of Art, Washington, DC; The Philadelphia Museum of Art; The West Point Museum and numerous Historical Societies and Universities. In 2012, he was a contributing author (Chapters 4 and 5) to the first conservation textbook, Conservation of Easel Paintings: Principals and Practice by Joyce Hill Stoner(Wintherthur) and R. Rushfield, editors. In 2015, Mr. Katlan has donated his extensive American Artist Materials Research files to the Henry Francis DuPont Winterthur Museum, Garden and Library. Did you ever wonder about the “canvas mark/stencil mark” or label found on the back of your painting? (example above) Did you know that the mark and even the wooden stretcher can often date a painting and determine its origins? Please contact Mr. Katlan as he may be of assistance to you on your painting.